 Under Threat: State Theatre in Hong Kong by G.W. Grey, S.F. Liu, Hong Kong, 1952 – Docomomo International (DATE: 23/3/2016) http://www.docomomo.com/events?sec=4&id=277. Cultural heritage group Walk in Hong Kong, The Conservancy Association and Docomomo HK today issued a joint statement to the Antiquities Advisory Board (AAB), urging them to give the former State Theatre in North Point no lower than a Grade 1 historic building grading. 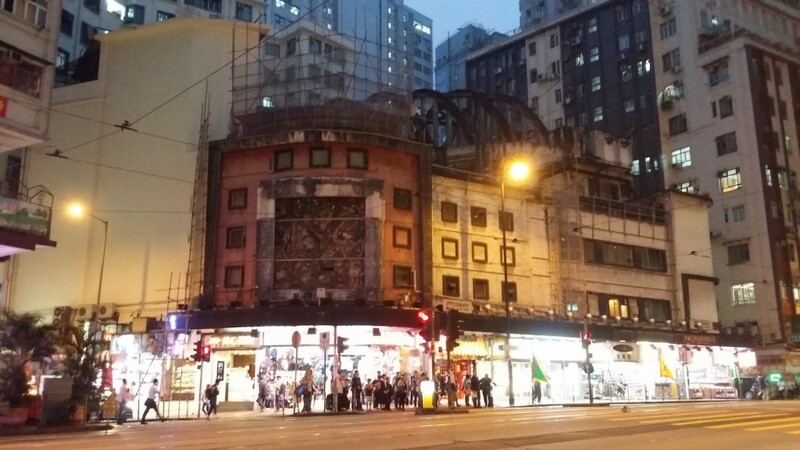 Walk in Hong Kong has written a Heritage Value Assessment of the Former State Theatre, which puts forward compelling evidence to establish the conservation value of the theatre. As the AAB are about to grade the building, we take this opportunity to present the uniqueness and irreplaceable value of the former State Theatre for the due consideration of both the board and the Antiquities and Monuments Office. The former State Theatre, together with Empire Theatre, which was how the venue was known when it opened in 1952, entertained the public with a scintillating mix of classical music performances, local and foreign cinema, Cantonese opera, as well as regional dance and music troupes. The theatre was a major cultural landmark in Hong Kong. Classic movies shown there include Lawrence of Arabia (1965) and Sound of Music (1966). In 1969, the theatre hosted Hong Kong’s first Japanese film festival. In the years that followed, Hong Kong movies became the mainstay at State. These include blockbusters such as the local comedy classic The Private Eyes (1976) and a host of Jackie Chan films. The former State Theatre was very much part of the heyday of Hong Kong cinema in the 1970s and 1980s. Earlier when the theatre was known as Empire, it attracted what might be described as high-end cultural arts to Hong Kong. Stage shows by international performers include the renowned British tenor Peter Pears and the legendary British composer Benjamin Britten, and Governor Sir Alexander Grantham was the patron of this particular celebrity recital in 1956. In terms of Cantonese opera, Dai Lung Fung (huge dragon phoenix) troupe was a well-known box-office winner at State. But the most famous artist to have ever graced the stage of State must surely be the Taiwanese pop superstar Teresa Teng, who performed there at the tender age of 17 in 1970. Before the advent of television and home entertainment, cinema was king. Going to the movies was the most popular form of mass entertainment in post-war Hong Kong. There used to be huge cinemas all over Hong Kong yet, practically every single one of these important ‘landmarks of the people’ between the 1950s and 1980s has gone, save for the former State Theatre. The social and historical value of this veritable Hong Kong treasure is thus exceptionally high. Built in 1952, the former State Theatre is a stand-alone theatre structure. It is the oldest post-war theatre in Hong Kong, and the oldest theatre on Hong Kong Island. Across the world, we see old theatres that have been or are being restored, revitalised or reborn as performance venues or cinemas. Recent regional examples include Penang’s Majestic Theatre (1926), Singapore’s Capitol Theatre (1930) and Yangon’s Waziya Cinema (1920s). Development is central to a city’s evolution, yet the theatre restoration cases from Southeast Asia show that development and heritage conservation can go hand in hand, allowing the legacy of culturally valuable architecture to be preserved. The spectacular roof structure of the former State Theatre towers over King’s Road like a giant public art installation. A highly-distinctive icon in Hong Kong’s cityscape, it captures the buoyancy of a past era, and there is no reason why it cannot belong to the future too. Indisputably an architectural gem both locally and worldwide, if this forgotten post-war wonder can be imaginatively transformed, it surely has the potential to develop into a tourism highlight and a cultural landmark that Hong Kong people can be proud of. Any self-respecting city should know where its soft power lies. The arguments we presented above are ample proof that the former State Theatre is a leading example of Modern Movement architecture in Hong Kong. The architectural style and construction technology that it pioneered is one of a kind in Hong Kong as well as in the whole of Asia. Add the theatre’s high social and historical value to its exemplary architectural rarity, one can only make a strong case for it to be preserved and revitalised. We are aware that a consortium has been progressively buying out flats and shop spaces in the State Theatre complex, and this puts the former theatre at risk of demolition. We appreciate that the preservation of privately-owned historic buildings is very challenging, yet we also urge the authorities to proactively look for a win-win solution with the owners. We want the government to demonstrate to the public that they have the determination, energy and ability to preserve Hong Kong heritage, so that the highly valuable former State Theatre can be preserved. We would also appreciate a face-to-face meeting with all AAB members, so that they can hear the views of the public, as they decide on a grading that we hope would do justice to the sheer heritage value of the theatre. Based on our comprehensive assessment of the heritage value of the former State Theatre, we consider that it should be given no lower than a Grade 1 historic building grading. Docomomo HK is the local chapter of Docomomo International, which is short for the International Committee for Documentation and Conservation of Buildings, Sites and Neighbourhoods of the Modern Movement. The assessment is in Chinese.